If you are in the market to buy straddle carrier forklifts, then Forklift Truck Direct is surely your best bet. Straddle carrier forklifts can be essential to organisations involved in the distribution, haulage and shipping sectors, and our Combilift Straddle Carrier is one of the leading models available anywhere in the world. We are recognised as the number one distributor of the Combilift Straddle Carrier throughout the counties of Suffolk and Essex, so trust Forklift Truck Direct when it comes to the purchase of straddle carrier forklifts. The beauty of the Combilift Straddle Carrier is the way it can deal with loads that are classed as oversized, thanks to its unique intelligent design and 35 tonne capacity. What it offers haulage and shipping distribution companies is complete independence when it comes to moving large shipping containers around a site, whether that’s from trailer to trailer or from a trailer to the ground. And the high weight capacity means this can ring true even when a container is fully loaded. One of the things you can look forward to after taking advantage of straddle carrier forklift sales is the flexibility to move container sizes from 20ft all the way up to 45ft. There are also a raft of features that your operators will be able to use, including the front and rear independent sideshift for easy twistlock alignment and two wheel hydrostatic drive. At Forklift Truck Direct, we are proud to have developed a strong relationship with Combilift, a company that is recognised as a leader in the UK market for four directional forklift trucks, currently boasting an 80% share of the market. Thanks to this strong relationship, Forklift Truck Direct are able to provide full support, meaning when customers buy shipping container transporters from us, they can expect service that goes beyond the point of sale. Our engineers have been specifically trained in services related to straddle carrier forklifts, and we are able to provide 90% of parts needed for the unit within 24 hours. If you are looking to buy a Straddle Carrier forklift then Forklift Truck Direct can help you get the best value for your money. 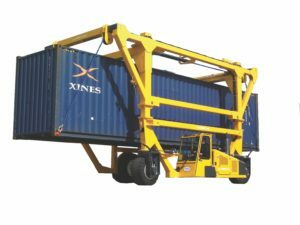 If you intend to purchase a shipping container transporter, you need look no further than the industry-leading Combilift Straddle Carrier. To discover how this model can enhance the efficiency of your operations no end, you can call us today on 01245 322252 and our friendly team of professionals will be happy to outline the benefits.